Have you noticed how grocery stores grab away all your money when you have paid a visit to just buy yourself a cold tetrapak of orange juice to quench your thirst? I'll admit that it happens to me every single time I walk into a supermarket. There is this feeling of satisfaction that comes onto me whenever I fill my cart with interesting new food/clothes/fruits/sauces/pasta etc, until my bill comes up to more than double the amount I expected! Sounds familiar? Well, it's no sign of being a shopaholic or the sorts, but, these are strategies that most supermarkets around the world practise in order to manipulate you into buying more. 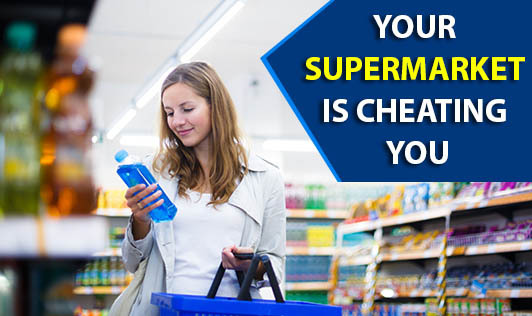 Here are a few strategies you should notice and pay attention to every time you walk into a super market. 1. Most people may walk in to buy something as simple as some vegetables or fruits or even juices or biscuits. But, have you noticed how these commodities that most of us would want to buy would be placed at the end of the store? This is just so that you walk through racks of interesting products before you get to what you need. When you look into your cart, you've already bought everything you need to start a family! 2. Big-sized shopping carts are another tricky strategy. A small survey at a supermarket did show how a shopper was tempted to fill up the cart if it was bigger. On the other hand, they somehow restricted themselves to a smaller amount when the cart was smaller sized! 3. Notice how good-smelling food like breads, pastries or good-smelling products like soaps, shower gels and bath products would be strategically placed in the beginning of a store. This is because the sensation of smell gets activated and that can keep you in a good mood to spend more. 4. Most stores are designed in a way that most of the products that customers may be "interested" in is placed at the end of the row. This way, the customer needs to walk all through the row and will definitely not fail to look at the other products on display. 5. Favourite and "most wanted" products are usually placed at the eye level. At the lower level, foods that may interest children may be placed. 6. The check - out line/billing counter will always have some expensive chocolates that you have been craving to eat for a long time. Isn't it easy to just pick one up at that point? 7. Most super markets have offers that give away free goodies. This helps them advertise and make themselves popular amongst customers. 8. The type of music played at supermarkets is also done with a reason. Studies show that soft and slow music keeps a customer relaxed and keeps him going through the entire store, while louder, fast music hastens the shopping time. Interesting, isn't it? If you are trying to cut on unnecessary expenses at supermarkets, keep your senses open to these cues, and you will do well!